DAY 1: ARRIVAL: Meet and greet at the Athens Airport to transfer you to your hotel. Free time. Overnight in Athens. DAY 2: CHRISTIAN TOUR IN ATHENS & ANCIENT CORINTH: Your private tour will start with the Acropolis site, a complex of buildings that includes the Parthenon (main temple)the best example of classic architecture of the 5th century BC , Erectheion (the temple with the 6 female figurers, Caryatides), Temple of Athena Nike (Wingless Godess), Propylaia (the monumental Gate), Odeon of Herodus Atticus, Dionysus theater and finally the Mars Hill or Areios Pagos (the first ancient court and the place that St. Paul preached the Christianity for the first time in Athens). Our next stop will be the Temple Of the Olympian Zeus (the largest temple in Hellenic and Roman times), the Panathenian Stadium (the stadium of the first Olympic Games on 1896), the memorial of the Unknown soldier and the changing of the Guards (Euzones) in front of the Greek Parliament, opposite the Syntagma or Constitutional square. Our next stop will be the Ancient Greek Agora with the beautiful St. Catherine Orthodox Church. The meeting place of Apostle Paul. He had to be there, where all the great philosophers and important men were, in order to discuss the new religion of the one and true God. When he was firstly there, he saw an inscription on the Unknown God, so he found a way to present to Greeks the One and Only real God, preaching the newly born religion. Some of the most important speeches of St Paul took place here. After that let's see the Trilogy of Athens (the Academy of Science, the First University of Athens and the National Greek Library) and drive towards the Peloponnese to reach the magnificent structure of the Corinth Canal, which is in Peloponnese, the southern peninsula of Greece. 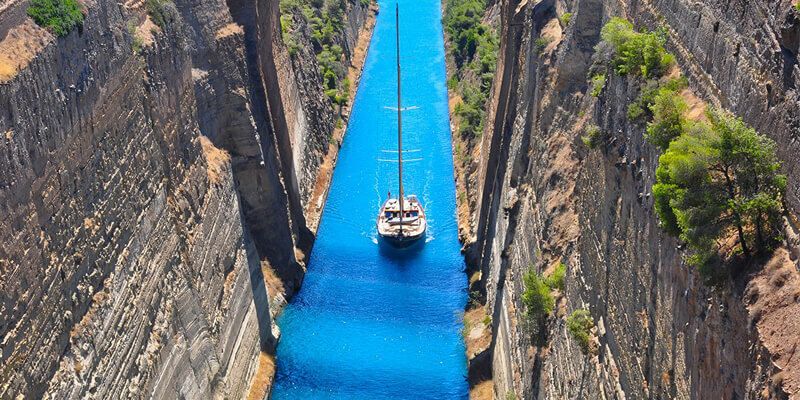 The Corinth Canal connects the Saronic with the Corinthian Gulf in the Aegean Sea. A dream of the ancients that came true in 1893. Time for rest and some amazing photos above the Corinth Canal. Leaving the Isthmos and driving to the ancient Corinth, where St. Paul lived for almost two years making a very important missionary work. There you will visit the archaeological site and museum, plus the church that has the 1st Letter to the Corinthians written in four languages, Greek, Arabic, French and English. Overnight in Athens. DAY 3: ATHENS – THERMOPILES - VLATADES MONASTERY OF ST. PAUL - THESSALONIKI: Leaving Athens, we stop shortly at Thermopiles where the statue of Leonidas stands as a memorial the battle of the 300 Spartans against thousands of Persian soldiers of the Persian Empire. We continue until we reach Tempi, a gorge with great view and the river Pineios crossing it! We reach Thessaloniki and after your check in and a short rest, we visit the Vlatades Monastery where it is said that Apostle Paul stopped to drink some water that's why called “Apostle Paul’s Holy Water". In the same area, there is also the Orthodox Church of St. Paul. Free time to stroll at Thermaikos Gulf in Thessaloniki having delicious Greek dinner! Overnight in Thessaloniki. DAY 4: THESSALONIKI - FILIPPOI - NEA FOKEA - KAVALA: Today, we explore Thessaloniki, where Paul preached and wrote two epistles to the Ancient Thessalonians. See the triumphal Arch of Galerius, The Rotonda, one of the most impressive monuments of Thessaloniki, St. Demetrius Basilica at the most important part of the temple with the underground ancient “Crypt”,where the saint was imprisoned here and died in 303 A.D. The Acheiropoietos Church which owes its name to an icon of the Virgin Mary, (‘Acheiropoietos’ meaning "made not by human hands "), which was kept in the church. We leave Thessaloniki to visit Nea Fokaia and the Agiasma of St Paul, which is the secret underground chamber that people hid him when he was chased after! Our next visit will be to Philippoi, the Baptismal site where even Lydia was baptized and was the first woman to have the honour! Then we will visit the Philippoi Acropolis, the Basilica Theatre and the place where St Paul and Silas were imprisoned. We continue to Kavala, the ancient Neapolis, which is the first European place where St Paul, Silas, Luke and Timothy visited. Lunch in Kavala. Overnight in Kavala. DAY 5: KAVALA – CRUISE TOUR AT MOUNT OF ATHOS: We will leave Kavala and will drive to Ouranoupolis so you can take the ferry for Mount of Athos that is called Virgin Mary's garden, the place where Holy Fathers have lived for centuries in enlightenment. For the Christians, it is a place of spiritual enlightenment, a place of worship, a chance for meditation and spiritual renewal. We will see 7 monasteries and our English-speaking guide will explain everything about the monasteries. The duration of the tour is about 3 hours. Once the tour is over, we drive to Thessaloniki. Overnight in Thessaloniki. DAY 6: THESSALONIKI –VEROIA - METEORA: . We move on to reach the beautiful town of Veroia. We visit the church of Apostle Paul and the marble-made ''Vima of Apostle Paul'', the place where Apostle Paul preached to the people of one of his beloved towns . We continue to the Ancient town of Vergina and to the King's tombs, such as the Alexander’s the Great father’s and ex-king. Driving through cemtral Greece, we reach Meteora. We will visit the BYZANTINE MONASTERIES of Meteora, that are included on the UNESCO world heritage monument list. Our first stop will be at The Holy Monastery of Great Meteoro which is the biggest and oldest one of all. 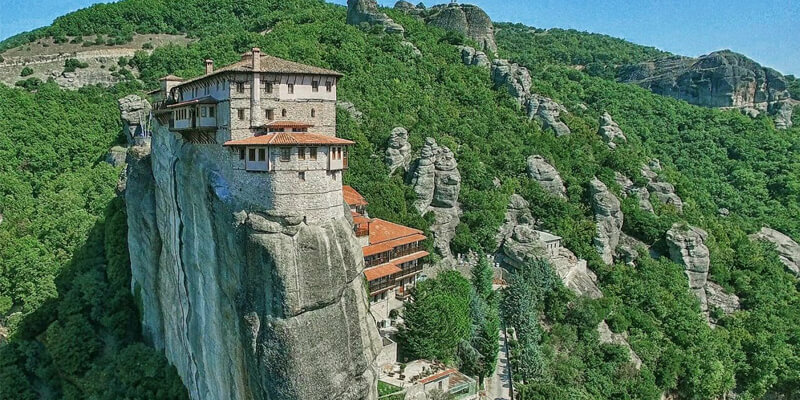 It was called the monastery that was "suspended in the air" (Meteoro) because it was built on top of a gigantic rock! The great monastery of St. Stephan is our next visit, which is a small church built in the 16th century and decorated in 1545.Overnight in Meteora. DAY 7: METEORA - DELPHI - ATHENS: We leave Meteora and head to Delphi. You'll visit both the archaeological site with the ancient theatre, and museum. 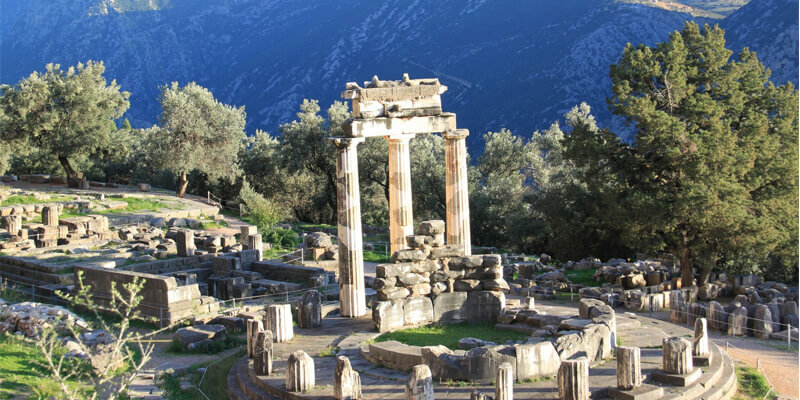 Delphi is the first touristic attraction of the antiquity, as it was busy all the year round. It was the place where God Apollo had his sanctuary,that the prophesis were given to every man, every prince, general and king by Pythia the High Priestess. It was the center of the universe, according to Zeus, king of the Gods. You will visit the Oracle of Apollo, the Omfalos, the temple of Athena Pronaia, Kastaleia Spring and see some magnificent artifacts and statues, such as Eniochos the charioteer, the twin Brothers and Sphynx of Naxos. Lunch at a traditional taverna and return to Athens. Overnight in Athens. DAY 8: ATHENS - SANTORINI ISLAND: Our driver meets you at your lodging to transfer you to Piraeus Port to get the ship for Santorini island. Our driver will meet you at Santorini Port to transfer you at your lodging. Free time. Overnight in Santorini. DAY 9: SANTORINI - DAY CRUISE TO VOLCANO (OPTIONAL). Our driver will pick you up at 09.30 to begin the voyage round Santorini. Our first stop will be at the spring of gushing lava of Santorini! You may have the chance to walk around and explore the volcano's edge. We are going to visit the island of Palea Kameni where the popular hot springs are found on the west side. A place that's really well known for its thermal waters where you would like you'll be able to appreciate a swim within the hot springs. Proceeding, we will visit the island of Thirassia, you may walk at the beautiful and conventional town and appreciate a lunch with authentic Santorinian cooking and gastronomy. At last we'll reach Oia. From there, you'll either climb the 200 steps on foot or ride the traditional donkeys. At Oia town, you'll have the chance to walk through around the Caldera’s beauty, as well as appreciate the foremost breathtaking nightfall of your life! After the dusk, at around 20.30 we will transport you back to your lodging. Overnight in Santorini. 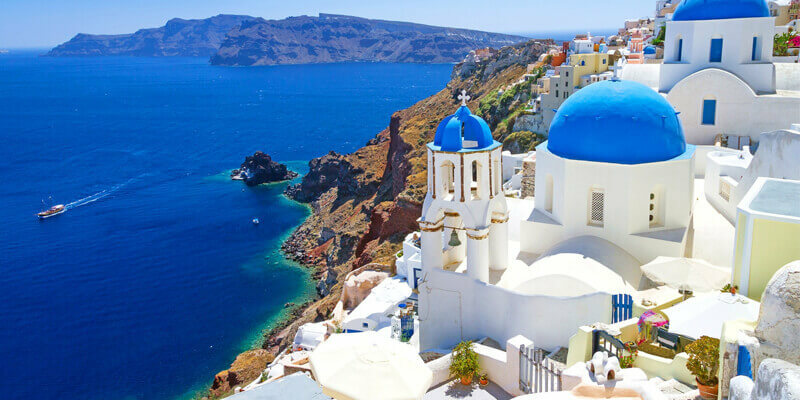 DAY 10: SANTORINI ISLAND - ATHENS: Enjoy your morning until we transfer you to Santorini port to take the ferry to Piraeus. Our driver will meet and assist you at Piraeus port and then transfer you to your hotel. Free time. Overnight in Athens. DAY 11: DEPARTURE DAY: Transfer to Athens airport according to your flight details.